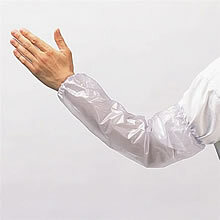 Polyethylene white disposable sleeves. 1 mil, 100 sleeves. Sleeves are not packed in a pullout slotted box. 18" length.